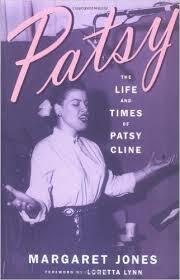 I paused in my reading of Ball Four by Jim Bouton because I found a biography of Patsy Cline at the library. I am so very much in love with biographies and memoirs of country music stars, especially female country music stars, but this one...I had to give it up. My disillusionment is worthy of a country song in its own right. Patsy: The Life and Times of Patsy Cline by Margaret Jones (1994) starts out strong and has some wonderful pictures, but as Patsy begins to pursue stardom, all the people and places Patsy encounters garner their fair share of print and the effect is that Patsy is crowded out of her own life story. If this weren't bad enough, the anecdotes about Patsy are repeated. As further evidence of sloppy writing and editing, descriptions of Patsy's mannerisms can be found in identical form on subsequent pages. The book may have improved as she became famous, but I felt bogged down and had to quit. It pains me that this turned into one of my DNFs for the year. Patsy Cline was an artist and a perfectionist. She was passionate about her craft. She deserves a better biography than this. I wish she had lived long enough to write her own memoir. Trying to get a handle on my bookworm heartbreak, I resumed Ball Four. Found out that I've been saying Jim Bouton's name wrong. I was saying it "Boo-tahwn" with a slight Frenchified nasal thing going on. Turns out that it's actually "Bough-ton". This information comes from an old-time baseball fan, so I trust him. Furthermore, he didn't laugh at my mispronunciation. Baseball is all about making adjustments. I love Ball Four and appreciate that Bouton had the courage to write it. He did a sequel called, I think, Ball Five and that covered the time he spent with the Astros. His stories about those days were hilarious. I knew that Houston had a "character" or two on the team back then, but it was even wilder in the clubhouse and hotels than I could have ever imagined. Good stuff. Dang. Too bad about the Patsy book. Thank goodness for solid baseball writing.